In medium bowl, mix lime juice, honey and salt; toss with remaining salsa ingredients. Cover and refrigerate at least 1 hour. Meanwhile, soak cedar plank in water at least 1 hour. Heat coals or gas grill for direct heat. Place salmon, skin side down, on cedar plank. Make diagonal cuts in salmon every 2 inches, without cutting through the skin. Rub brown sugar over salmon. Place cedar plank with salmon on grill. When cedar plank begins to smoke, cover grill. 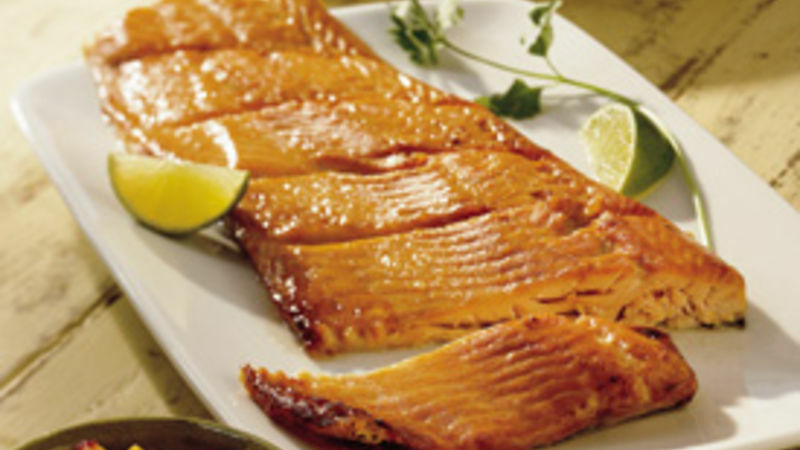 Cover and grill salmon over medium heat 30 to 35 minutes or until salmon flakes easily with fork. Remove salmon from plank, using large spatula. Serve with salsa. A mango has a long flat seed inside which is the same color as the flesh. Use a paring knife to cut the flesh and skin from each of the flat sides as close to the seed as possible. Cut the skin away from the edge of the seed, and then cut off the flesh. Discard the seed. Score the flesh to the skin in the remaining sides. Push inward on the skin (turn inside out), and scrape off the fruit. It's now ready for chopping. Make sure the cedar plank you use is untreated because of its direct contact with the food and so there are no unpleasant odors. Check local lumber suppliers; there's a good chance of finding this size piece in the "odds and ends" bin.